The chart below shows SQM correlated with USO. SQM is the blue line and USO is the red line (click on image to see larger more clear picture). As you can see they are correlated quite well, minus a few earnings reports and downgrades to SQM last summer. Overall when the price of USO (pure crude oil ETF) rises, the price of SQM also rises. However recently from the charts you can see that they have disconnected a bit. SQM has stabilized hitting its 52 week low in October, and I believe we have seen a bottom for the price of crude oil. Assuming the correlation between the two will return at some point, based on last year's activity, as the price of crude oil rises SQM should also rise. SQM has a nice head start so we may see SQM hit levels similar to last year assuming crude gets back into the 60-70 per barrel range. The jobs number is coming out tomorrow morning and that will have a major impact on the markets. The consensus estimate is 7.9% but I think it will be higher maybe as much as 8.4%. To think about the real unemployment number is even scarier! I bet the real unemployment number is around 14%. We could see a major sell off on a worse than expected number with huge volume. This may be the news we're waiting for to form a market bottom. Not to mention I think this number is already factored in pretty ugly, and I think a slight miss could even rally the markets. I am starting to think that capitulation does not exist- but this could be the news! If we can get a major sell off on huge volume and rally higher, I think it may be safe to say we have found the short term bottom. Who Knew it was McDonald's? Recently when I have been walking into many supermarkets and driving by gas stations I have noticed these red boxes. Inside these red boxes are rental DVDs for $1 a day. Why didn't I think of this genius idea?! Anyway you're probably asking yourself right now; what does this have to do with McDonald's? Well I've been wondering if these guys were a publicly traded company for some time, and today I finally had some time to do some research on them. The name of the company is Coinstar and I called them and wanted some investor information and they gave me their ticker symbol which is CSTR. Each of the rental boxes is owned by them and they give a commission to the store or chain that has it on premises. During recessions the entertainment industry usually does very well (Internet, movies, video games etc...). People are cutting budgets as usual in this recession, and a night of entertainment for $1 is a bargain! Movie giants such as Blockbuster may be in deep trouble as well giving these Red Boxes less competition. Nov. 17, 2005--Coinstar, Inc. (Nasdaq:CSTR) today announced an agreement with McDonald's Ventures, LLC, a wholly-owned subsidiary of McDonald's Corporation (NYSE:MCD), to invest in Redbox Automated Retail, LLC. Coinstar will invest $20 million in cash and will own a 47.3 percent share in Redbox. 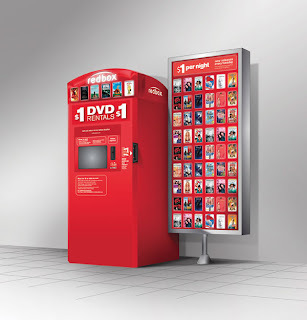 Redbox is the leading renter of DVDs through self-service kiosks with about 800 locations in the United States, including McDonald's restaurants and supermarket locations. The Redbox business has been in operation since 2002 and currently is a majority-owned subsidiary of McDonald's Ventures, LLC. Therefore you have the answer, McDonald's has a nice hand in these Red Boxes as well as CSTR. So if you think these Red Boxes are a great idea you may want to invest in CSTR or MCD, either one has ties to these Red Boxes. The gambler in me wants to bet on CSTR, and the conservative in me wants me to pick up some MCD. I think if these Red Boxes continue to have strong growth like the past, it is a great buy at these levels ($25 range). Since the article above (Nov. 2005) Red Box has added 8200 kiosks nationwide and they expect to double that number by 2012! That's some aggressive growth! To make a long story short about today's trading I was enjoying the much needed rally so I did not trade too much. While we were up near the highs I purchased some SDS that I will most likely trade within the next few trading days. I think we should (if we did not already) hit a short term bottom soon. I am not convinced however because most of the financials did not have a strong day compared with the rest of the market. I believe in order to get this market to go higher some positive news about the banks must come out and rally the financial stocks! If we were to hear some good news about them anytime soon, I don't think anything could stop the S&P from getting back to 800. 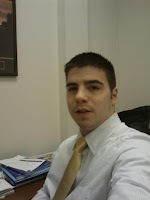 Anyhow because this is my 50th post (I know still a rookie compared to many bloggers) I have decided to tell my story. I have received a lot of emails asking me how I can be so into the financial markets and how I know some of the info that I know (mainly about trading options) at the age of 22. So here is my story... I hope you enjoy. My birthday is 8 days before Christmas so for my 11th birthday I was given some money and I put it into the bank (unlike most kids that age), and then for Christmas I was given some more money and also put it into the bank. Well the city I am from is Corning, NY- famous for glass etc hence the ticker GLW (Glass Works). Well it was December 1997 and the stock had just came down from its 52 week high about 40%, when my father (who passed away in October 2004 due to pancreatic cancer God bless him) suggested I "invest" my money. I only had about $500 saved up, but $500 to an 11 year old seems like a lot of money! He told me that I could turn that into a lot of money if I was patient and did my research. Of course the company has buildings everywhere in Corning so it wouldn't be too hard to do my research. So I took his advice (the best advice I have ever taken), and had enough to purchase about 15 shares (it was trading around $34 a share- the charts won't show that but it split 3 for 1). He told me that he would throw in some extra money so I could have an even 20 shares, so I said DEAL and we opened up an E-Trade account and I bought the 20 shares. After I had purchased the shares I began to watch CNBC and Bloomberg religiously and holding conversations about the stock with many of my relatives who worked for the company. I learned so much about the stock market from talking about and researching that one stock. Then Something happened... The country was undergoing a HUGE change... The TECH BOOM! I watched my money grow and grow everyday. I remember coming home from basketball camp one Friday in early August being shocked, I had made $500! A pretty nice pay check for a kid going into the 8th grade! Anyway my father knew trees don't grow to the sky and told me I should sell some... I felt like GLW was going to $1 million a share so I didn't want to part with it, but then he gave me another "investment" opportunity! He owned a pretty nice bar on Market Street in Corning which did extremely well during the BOOM years. He told me that I should buy a coin-operated pool table and put it in there. Well he convinced me- I sold 10 shares of GLW stock for $270 a share (I insisted on keeping the last 10 shares which I wish I would have sold as well). I had more than enough money to buy a very nice coin-op pool table. The going rate for a game of pool was $1 and there was about 500 games played a week! He let me keep all the profits as long as I put 20% in the bank to pay taxes when the time came. So I would empty the pool table every weekend and being so in love with the stock market, I would put roughly 80% into my E-Trade portfolio and the other 20% into my savings to pay taxes with. Things went well for another 6 months, I was making about $500 a week pre-tax and playing the stock market with a portfolio worth nearly $10,000, when suddenly things took a turn for the worst. Within 2 years that same $10,000 was worth about $500! Corning was hit hard laying people off in Corning left and right, and the bar business was getting worse as well. I think I was making around $250 a week- which is still very good for a 15 year old. I was still contributing the 80% to the stock market weekly buying up more shares than I ever imagined. Well during those 2 years I must have accumulated about 5000 shares of GLW alone at an average cost of $2.15 a share, I also purchased many other stocks, including many dogs that never rebounded, such as Lucent (LU) now Alcatel-Lucent cough cough, but overall it paid off in a big way. I sold most of my GLW stock at $17-$22 a share but I would trade it back and fourth. I was also buying and selling many other securities as well. I was taught the easiest method for trading stock options at the age of 16 [which I have replicated for my readers in my simplified stock options E-Books], which turned out to be one of my best financial moves ever! Therefore, in addition to trading stocks, I was also trading stock options, which I mainly use today as a source of investing/income/speculation purposes etc... Without using stock options, I have estimated the profits I have made from the market in the last 5 years would be less than 20%, no exaggeration! I know how bad things are right now, but WE WILL RECOVER! It seemed like it was the end of the world to me then, and I'm sure some people are thinking that now. If you don't need the money today keep a portfolio going, adding as much as possible to it! Stay diversified, keep on top of your research, and just ride out the storm! Nobody will call the bottom, just contribute the same amount to a particular security each week, or set up a similar system. I am a trader, but I have been accumulating some positions on the side to hold for the long run. When I took advantage of the beaten market during the BUST it turned out to be the best move I've ever made. I'm not trying to brag but today I am 100% debt free, without any school loans, my car is paid in full, I don't carry any credit card debt, I don't have to worry about where next month's bills will come from, etc... And I plan on going to graduate school in the fall of 2010 and paying in full, regardless of how low of a rate I could receive. Every great economy experiences economic stresses. When the country emerges from this recession it will be better and stronger than ever before. Happy square root day! We won't get another one until 4/4/2016. I am also excited to announce that I have finished writing my E-Book on how to trade options. In my E-Book I explain how to trade options using simple examples. It is a great investment because I can guarantee you will make over $7.99 writing your first covered call! I think we are due for a bear market rally! I cannot believe how easy it is to short this market. I covered more of my shorts today, but I also purchased some PUT protection is case we keep on falling. I think the market needs to correct itself to the upside a bit however. I think we are at least due for a 100 point 2-3 day rally on the S&P 500. I hope I am right for the bulls out there. I was purchasing some HOG (Harley Davidson) calls today for the 10 strike, GS (Goldman Sachs) calls for the 90 strike, as well as some V (Visa) calls for the 60 strike, all for the March expiration. I had to cost average down my positions I opened less than a week ago. I will sell into any strength. The chart below is of the S&P 500 for the last 10 trading days. This chart is telling me we'll be getting at least one good rally by market close Wednesday. If you look below the chart of the S&P 500 you will see RSI (relative strength index), this is indicating we are oversold. We spent the entire day of March 2, 2009 in oversold territory. Click on the image of the chart to get a larger more clear picture. RSI was at a low 22.50 today and the last time it was that low on a 10 day 60 minute basis we had over a 100 point rally in the S&P 500 over 4 days. Once again this is just my assumption that a short term rally could be underway. Early summer 2008: Oil was on a breakout trend heading toward 150 a barrel and Goldman Sachs kept raising the crude oil price objective. I realized that on days when crude oil would spike that Goldman Sachs was also trading higher. It was unusual because GS may have been the only financial stock trading higher with crude. As financials continued to melt down GS hung in there. Then crude started crashing and so did GS. At one point the pattern matching software I use correlated GS and USO (Crude Oil ETF) to be .997. GS reported their first loss ever during the same quarter that crude oil got hammered. USO lost almost 60% of its value in Q4. I think if we some stabilization in the commodity market, GS will also stabilize and perhaps go higher. 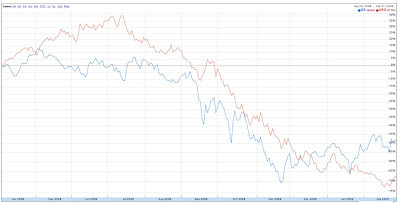 We are well off the crude oil lows, but are hitting new lows on the Dow and S&P everyday. It seems GS is hanging in there and is well off the lows as well. As of right now USO and GS are nowhere near as correlated as they were in June or July but they remain over .80 which is significant. Below is a chart of both USO and GS trading from April 2008. GS is the blue line, and USO is the red line. Click on the image below to see a larger more detailed chart.